As you may have noticed in the past, I have a strange fascination with visual renderings of data and concepts. I make up stupid graphs and charts all the time, and most of the time they have limited to no (to negative, even) utility. It should be pretty obvious that I am not a graphics guy, nor am I a stats guy -- I'm all about concepts and generalities, which is how I ended up as a strategist (!) -- so the execution of this stuff (as opposed to conception) does not come simply to me. But if I stumble across a way to visually explain an idea in a form that strikes me as massively simplifying, that seems like something worth sharing. I expose you to my stumbling efforts in the hope that people who are better than me with this stuff (read: everyone) will offer suggestions and improvements. I've lately been playing around a little bit with Edward Tufte's "slopegraphs," which you can read more about here. Really I was just looking for an excuse to draw some and see if I could come up with something useful, so I went for a data set that's simple and familiar to me: NATO member states' military expenditures as a percentage of GDP. I used this year's Stockholm International Peace Research Institute database, which is generally accepted as the authoritative data source on this subject. And on the bright side, there will actually be some meaningful content in this post: I may not be able to draw good graphics, but I can sure as hell analyze (qualitatively, of course) and offer an interpretation of the substance behind them. First let's do a really quick primer on slopegraphs in case you didn't click the link above (which you really ought to do, as you'll see a couple of extremely elegant and illustrative examples of this type of graphic). The point of a slopegraph is to be able to show comparative hierarchies of a particular measure while also visualizing trends like rate of change, both in a comparative and real sense. So on the left you see a list of countries ranked from top to bottom by military expenditure as a percentage of GDP in 2001, with Russia on the top at 4.1% and Latvia and Japan sharing bottom spot at 1.0%. 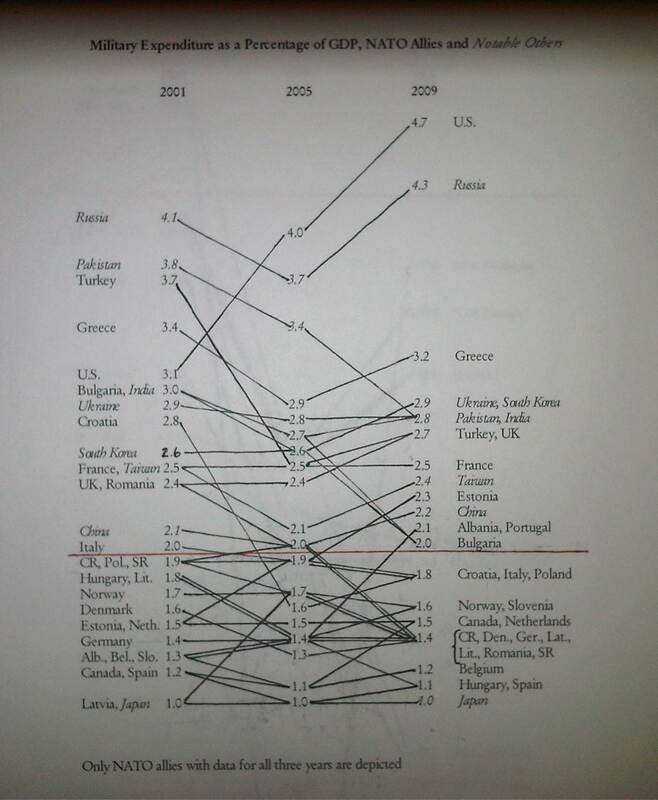 The data for 2005 is shown in the middle column, connected by a sloped line to the same country's figure in 2001 and 2009, which data populates the right-hand column. Now you see a different hierarchy for 2009, so you can see both how the individual countries' percentages have changed (lines sloping upward from left to right show growth, obviously, and downward shows a decrease) and how the overall rank order has changed. There's a spatial element, too: were it not for variable spacing based on the value of each number, the slopes themselves would be meaningless. 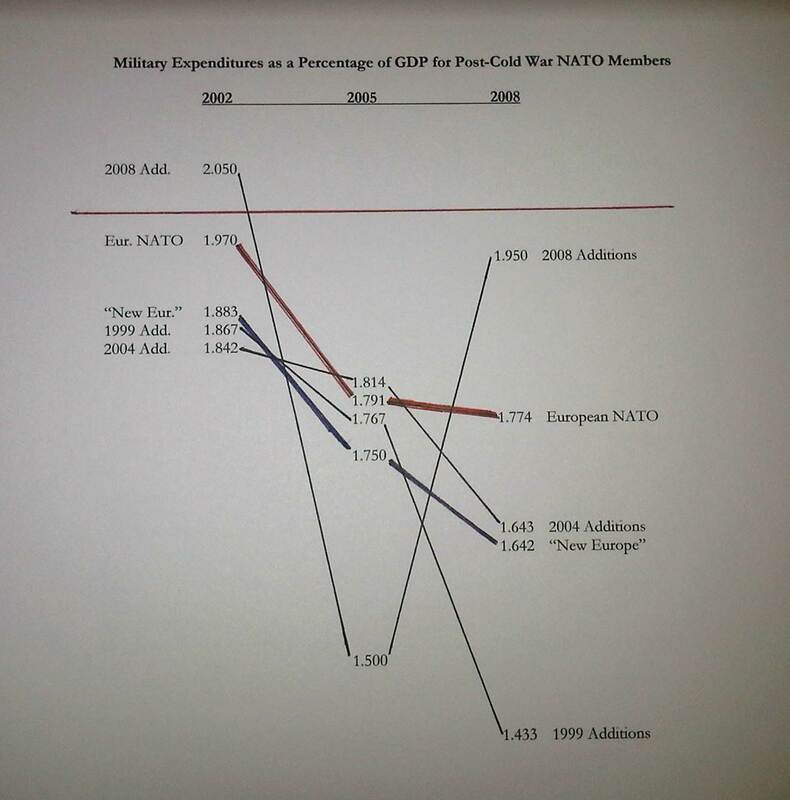 In a sense, the jumble of lines on the lower half of the graphic helps to illustrate a significant point: that many NATO allies have spent less than the agreed-upon benchmark of at least 2% of GDP (represented by the horizontal red line). The clutter also starkly shows how the oft-noted difference in proportional spending between the U.S. and the rest of the allies is mostly a product of the last decade's wars: in 2001, after the significant U.S. defense budget cuts of the 1990s, American expenditures were among the highest as a percentage of GDP but not so dramatically separated from the pack. Also perhaps worth noting (and more on this later): while Canada's operational contributions to the war in Afghanistan mean that it is often singled out for praise by Alliance and U.S. officials, Ottawa devotes one of NATO's smallest shares of GDP to its military. The next graphic shows the average percentage of national GDP spent on defense for several sub-groups within the Alliance. "Old Europe" comprises those countries that were members during the Cold War, while "New Europe" includes member states added during the enlargements of 1999, 2004, and 2008. (Yeah, I know these grouping don't jibe with Don Rumsfeld's intent, but I don't care. I'm stealing his terminology, not his concepts.) Those new member states are grouped by their year of accession, though this may be the only thing they have in common: Poland, the Czech Republic, and Hungary in 1999; Bulgaria, Estonia, Latvia, Lithuania, Romania, Slovakia, and Slovenia in 2004; and Albania and Croatia in 2008. For reference, I've also included slopes for the entire Alliance, for the European members of NATO (excepting the U.S. and Canada), and for all non-U.S. members (European states plus Canada). There are a several interesting notes here. First of all, you'll see at the bottom of the page that two numbers are in brackets: 1.500 in 2005 and 1.433 in 2009. These represent the 2008 and 1999 additions to the Alliance, respectively, and the bracketing of those low outlier values is intended to indicate that spatial representation of the data would take the data points beyond the lower edge of the paper. Another thing that jumps out is that nearly all these averages are below 2%, including the full Alliance average -- the one that includes U.S. spending! The only groupings that averaged more than 2% of national GDP in any of the selected years were the Cold War-era European allies in 2001 and the two recent additions, Albania and Croatia, also in 2001. (This latter grouping would seem to have little significance, seeing as it's made up of only two countries and is skewed upwards by a relatively high 2.8% of GDP spent by a country that had seen war in the previous decade. The dramatic jump back up from 1.5% to 1.95% between 2005 and 2009 is similarly misleading: while Albania made small, incremental increases that surged after accession, Croatia's spending dropped off significantly in the early part of the decade and then remained stable.) And so it happens that in a decade of unprecedented global military expenditures and increased operational tempo and warfighting demands on Western countries, the point of highest average proportional spending by the relevant sub-groups was in 2001 -- prior to the start of those operations! I alluded to this above, but you should also take note of the fact that the Non-U.S. NATO figures are a few percentage points below the European NATO figures across the board... meaning that Canada's thriftiness is dragging the purportedly stingy Europeans down. 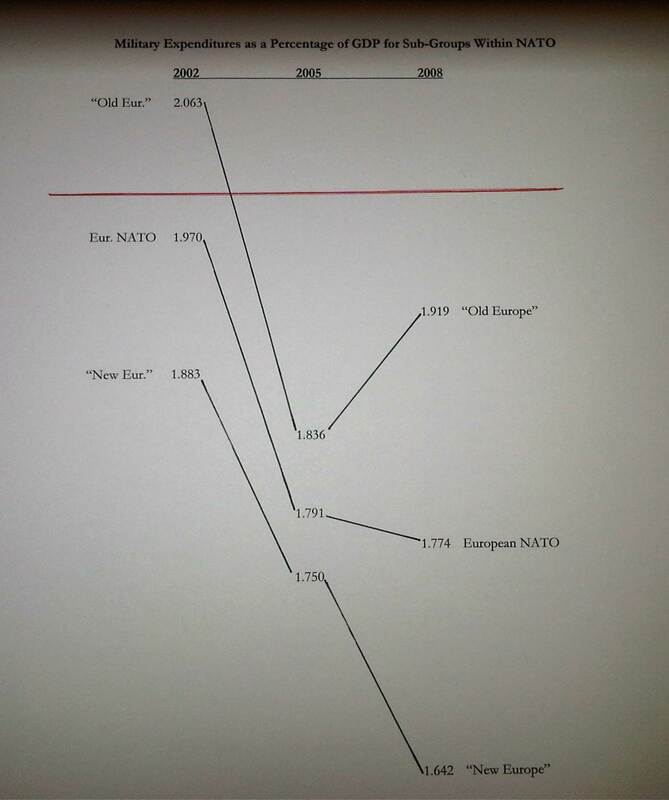 Next up is the slopegraph that I think is the most elegant and powerful of the four: a comparison between "Old Europe" and "New Europe" with the European NATO figures included for reference. Considering the popular wisdom about which allies are and are not pulling their weight in NATO, I think many people will be surprised to see this graphic. Of course, some analysts have perceived the not-so-subtle shift in new member states' priorities over the last several years. But here's the proverbial picture worth a thousand words: the former Eastern bloc countries have consistently contributed a smaller share of GDP, on average, to their defense over the last decade. As coalition operations in Afghanistan ramped up in the latter part of the 2000s, the traditional allies held spending steady or made slight increases. [I said before that I'd explain why Portugal's omission doesn't really matter, and here's a good opportunity: its values for 2001/2005/2009 are 1.9/2.1/2.1, which hold with the "Old Europe" trend and would actually have made the comparison with new members slightly more distinct.] The opposite is true of the former Eastern bloc countries, of which only Estonia and Albania (an aspiring and then brand-new member) aggressively increased their defense share. The dynamics of this increasing disconnect between perception and reality are indicated by the last slopegraph, which shows each tranche of new members (and the "New Europe" line that represents the average of all post-Cold War additions) alongside the European NATO baseline. You should see that the scale of this graphic is somewhat different to that of the previous two, as a wider range of values is accommodated across a smaller vertical space. We've already talked a little bit about the anomalous figures for the 2008 grouping, and frankly it might've made sense to just throw that one out. But take a look at the differences between the data for the 1999 additions and those allies that joined in 2004. The average share of GDP for Poland, the Czech Republic, and Hungary, lauded as the most aggressively pro-Western of the new democracies to emerge from behind the Iron Curtain, dropped dramatically over the decade following their admission (including a staggering 19% decrease in average share of GDP from 2005 to 2009). Some of this can be explained by the reduced requirement for dramatic transformation of post-communist conscript armies, which was presumably significantly more expensive than operations, procurement, and other costs in the steady state. But surely much of it is attributable to the fact that the new member states faced less pressure to abide by pledges to hold defense spending high now that they could no longer be denied entry. The same downward spike was evident after the admission of the next tranche, consisting of Bulgaria, Romania, Slovenia, Slovakia, and the three Baltic states: after holding firm in the lead-up to the 2004 enlargement, the bottom has simply fallen out of several states' budgets in the time since then (to the tune of a 9% fall-off in average share between 2005 and 2009). As Secretary Gates made clear before leaving office, worries about a two-tiered alliance no longer break down along the same lines as during the Bush administration, when the U.S. and its plucky new post-communist allies were thought to be eager for a fight in contrast with the staid and stingy Western Europeans. Instead the UK, France, Germany, Italy, and Norway have held military spending relatively steady as a percentage of GDP while many new NATO members have sought to cash in on the security dividend of Article 5 guarantees to redirect some spending away from defense programs. These trends should have been predictable: after all, it was certainly in the interest of NATO aspirants to dedicate extra resources to defense for a time in order to achieve vital diplomatic (and by consequence, strategic) effects, while the military expenditures of traditional allies will have settled at their current levels through iterative analysis of defense requirements and other governmental spending priorities. Over the next decade, I'd expect we'll see the same phenomenon occur with the new allies, and barring unexpected surge requirements (which, of course, we can't do), spending/GDP ratios should be reasonably stable and settled across the alliance. Maybe Albania and Estonia will continue to increase spending and outstrip their similar neighbors, but probably not. Proportional defense spending obviously isn't the only indicator of commitment to the Alliance's health and well-being, and it would be unfair to dismiss the contributions of Canadian, Polish, and Dutch soldiers (and Estonians, for that matter) just because of unimpressively average budgetary contributions. But it's certainly interesting to see how the numbers don't exactly sync with popular expectations. "the UK, France, Germany, Italy, and Norway have held military spending relatively steady as a percentage of GDP while many new NATO members have sought to cash in on the security dividend of Article 5 guarantees to redirect some spending away from defense programs"
which is a nice finding. Thanks ADTS. I was (and let's be serious, sort of still am) starting to have self-pitying thoughts about the depressingly steep slopegraph that charts the inversely proportional ratio of time and effort expended on a post to reader interest in same. Nice analysis. Would be interesting to look at a couple more dimensions of NATO, and international security cooperation more broadly. First, it would be interesting to compare participation by NATO members in both NATO and non-NATO operations, especially in terms of size and duration of troop deployments (given that they carry so much higher domestic political risks for the deploying government). In fact, this might be a reasonably proxy for public attitudes towards expeditionary military ops in general. 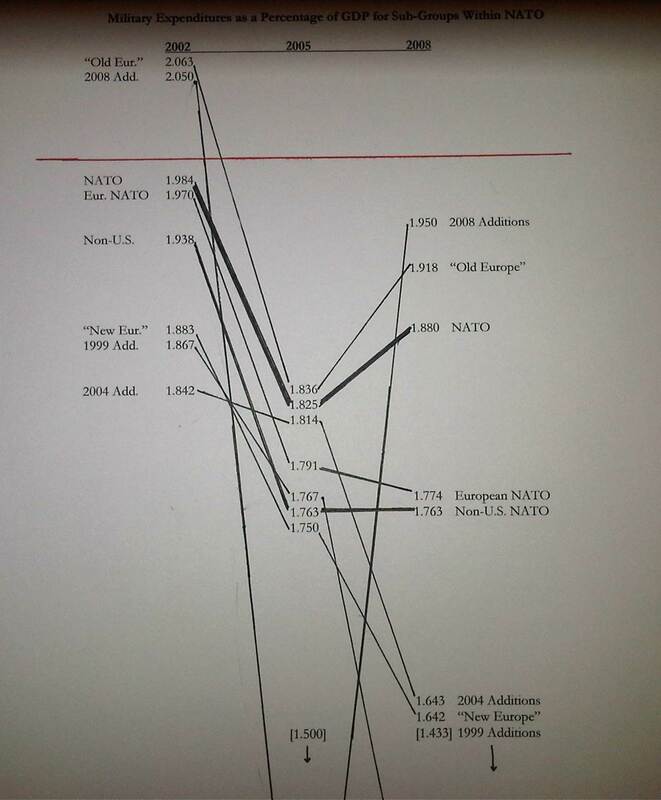 Second, comparing all these numbers for NATO members vs non-NATO Western allies (e.g. Australia, Japan). Would probably have to exclude Israel and South Korea, though - their peculiarities would skew the numbers pretty badly. For all the talk given to two-tiered alliances, having others pull their weight, etc, your analysis (and others) point to the fact that "the West" as a whole is facing significant relative decline, whether on defense spending, portion of global GDP, portion of global population, etc. The U.S. is in relative decline as well (people bemoan this but it was a policy objective to spur global economic growth, so this is a policy win), though it will not be eclipsed by China or anyone else as the dominant global power anytime soon. The U.S., though, will find its relative decline even more pronounced as its allies are forced to withdraw ever more from the global stage. This means that America should be prepared to continue its global leadership role with far less help from its habitual allies. Interesting times are afoot. It is good to see east europeans are putting their money where it might benefit their people rather than waste it on militarism.